Take tests in a calm, relaxed way and enjoy the freedom and power of achieving the results you want!! Power your mind to improve exams and test taking – whether you’re in preschool or doing a Ph.D.
Steve G. Jones, Ed.D., Clinical Hypnotherapist, charges $1,500 for a custom recording and $25,000 for a one-hour private hypnotherapy session at his office. But you can get all the benefits for this low price. Simply listen to the Improve Test Taking Hypnosis MP3 every night as you go to bed for three weeks and feel the changes happening in your life. You will feel more empowered, more in touch with your true self, and you will truly know that your goals are within your reach. “Steve….I think you would be pleased to know that I utilized your session Better Test-Taking to help me pass Illinois Dept. of Agriculture tests to obtain a license as a CERTIFIED PUBLIC APPLICATOR of insecticides and herbicides in Illinois. I used the breathing procedures while driving to the testing site together with affirmations to remind myself that I had studied the material diligently and was ready for the test. When I sat down to the table with the test in front of me, I felt absolutely calm and confident and said to myself…..OK, let’s see what we can do with these tests! Steve G. Jones achieves AMAZING and LASTING results!!! Hypnosis is the easiest way to affect change in your life because the positive messages go straight to your subconscious mind effortlessly so you can accomplish your goals and reach for the stars!! All you have to do is listen to the Improve Test Taking Hypnosis MP3 download at night as you go to sleep!!! You’ll hear soft music, the gentle sounds of the beach, and the soothing sound of Steve G. Jones’ voice all working together to bring about positive changes in your life easily and naturally. Steve G. Jones has been helping people improve their lives with hypnosis for over 17 years…now it’s time for him to help YOU… don’t wait, do it NOW !!! you’ll be glad you did. See you at the top! I know a thing or two about taking tests. I am currently working on my doctorate degree in education. I feel like I have been in school all my life. I am also a teacher. I have certified thousands of students in the field of hypnotherapy. As a student I have learned how to take tests and as a teacher I have learned how to write tests. There are two aspects to taking tests. One aspect is that you must be proficient in the information it is testing you on. The second aspect is being knowledgeable and confident in your ability to take tests. A hard test doesn’t necessarily test you on difficult topics. A hard test challenges your mental capacity and your ability to reason and strategize. Anyone who is in school can benefit by improving their test taking skills. Everyone in school wants to be more confident while taking tests no matter how prepared they are. All students wish to perform better on tests. I encourage you to improve your test-taking skills by exploring different ways in which you can challenge yourself. And you are so very relaxed and focused now, relaxed and focused. Just like you are when you study. Just like you are when you take tests. And relax now, imagine yourself studying, preparing for a test, that’s right. Imagine yourself studying, that’s right. And see how focused you are. The information goes into your mind easily and effortlessly, it just flows into your mind easily, that’s right. You are so relaxed now and at ease, so relaxed and at ease. Realizing just how easy it is for you to study and focus while you study. So relaxed and at ease as now you imagine yourself taking a test, any test you choose. Perhaps you have a test coming up or perhaps you just want to imagine yourself taking a test in general and see how easily the information comes back to you now. It’s almost as if you are able to read the information from your mind as if you are reading a book and you are able to get the information onto the test, that’s right. Whatever kind of test it is, you are able to produce the information from your mind. Your memory is excellent. Your ability to focus is excellent. Your study skills are excellent. Your test taking skills are excellent. And realize that all of these things are becoming more powerful day by day. So relax and realize that when you take a test, you are very efficient and able to provide the necessary information easily. You are able to bring the information from your mind to the test. Your mind is becoming like a very efficient computer, storing and retrieving data easily and efficiently. So relax now and realize just how powerful you are. The Improve Test Taking Hypnosis MP3 session will help you improve your test taking skills, no matter what age you are or what grade you are in. It is meant for tests of all difficulty levels. This self-hypnosis recording will target your subconscious mind so that you are in control while taking tests. This hypnosis program will give you the ability and the confidence you need while taking tests. It will reduce anxiety and improve your ability to retrieve information for tests. I’m sure you have been there at some point. You sit down to take a test and your mind goes completely blank. Or you are too nervous to think straight. This happens to so many people. Tests are challenging and how well we perform on them often has major consequences. The good news is that scientific studies have been performed that show that self-hypnosis has many benefits and actually helps people take tests to their full potential. The Improve Test Taking Hypnosis MP3 session will help you to prepare for tests. Some people are great at taking tests, this recording teaches you that skill so that you too will be great at taking tests. There is a lot of pressure on you when you take a test. There is the pressure that you, your teacher, and perhaps others put on you to do well. 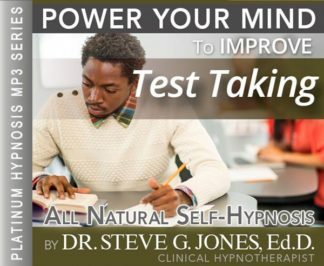 This powerful hypnotherapy program allows you to be confident during your test. Confidence is important because if you think you will do well on the test, you will. The Improve Test Taking Hypnosis MP3 recording also allows you to drown out distractions that might occur during tests. Whether there is someone else in the room tapping their pencil or coughing, you will be able to remove all distraction and be able to focus on the test. You will also be able to get rid of your internal monologue that is distracting you from the test. Improve Test Taking Hypnosis MP3 gives you the ability to be at your peak concentration level. You will be able to fully focus on each individual question and reason through it rationally and logically. It is suggested that you listen to this program for 21 nights in a row before going to bed to receive the maximum benefit!